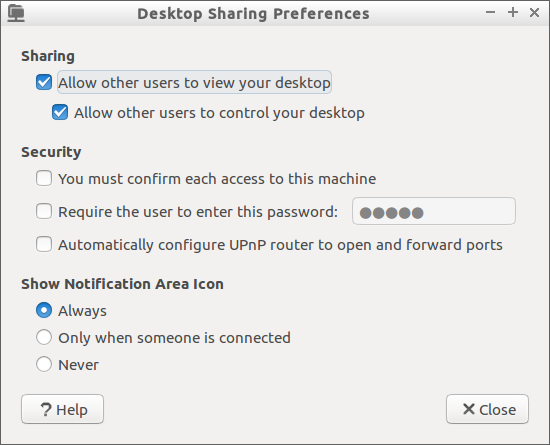 The following describes how enable desktop sharing via the Chrome Remote Desktop for Linux (Beta). This has been tested using "Lubuntu", Google Chrome and the Android application for the Chrome Remote Desktop app (on a Moto G). It should be mentioned that security though considered, was not the top priority rather functionality was. Please take care and caution as there are security implications that you should understand before deciding to reproduce results. Firstly it is not desired to run the Chrome Remote Desktop as root but the installation is accomplished using a sudo account. With my customized version of Lubuntu, installation gives prompt for a sudo password, but no option to choose the sudo user. The easiest way to resolve this (which may not be a problem on the standard Lubuntu desktop, as well as Xbuntu and Ubuntu may not have this issue), simply give temporary sudo access to the user account that the Remote connection will be used on and install the the Chrome Store app download the deb package and install (whatever way you want, personally dpkg -i). At this point sudo access is no longer necessary. My choice has been primarily to share a desktop and the simplest way to this was to use a blank Xsession so using the line /etc/X11/Xsession is all that's needed in the ~/.chrome-remote-desktop-session file. Set an environment variable to match your "Host Desktop" as the CHROME_REMOTE_DESKTOP_DEFAULT_DESKTOP_SIZES It seems to work better when the resolution matches the desktop we want to access. With vino installed you need to change the preferences, so from a terminal vino-preferences enable viewing of desktop and control as well. Now you may want to also check confirm access, require password, or auto config router... Don't all three should be unchecked.